Paris, France (November 15, 2017) – Ymagis Group (FR0011471291, MAGIS, PEA-PME, TECH 40), the European specialist in digital technologies for the film industry, today reported its consolidated financial results for the third quarter 2017 and first 9 months of the 2017 fiscal year, ending 30 September. Ymagis Group’s activities resumed growth, with the consolidated financial results for Q3 2017 slightly up at €43.2M, for an increase of +2.1%, driven by the Group’s services activities. Ymagis Group’s revenue for the first nine months of the year remained stable at €125.5M as compared to the previous year (€125.9M). The expected drop in VPF revenue was compensated by the growth in Eclair activities, with Christa Kistner, Tecnison and ST’501, which joined the Group in late 2016, accounting for most of the progress. VPF continues to decline, as anticipated, recording a drop of 20.9% in revenue during Q3 2017 in line with the recoupments made in Poland, Austria and the Czech Republic. Over 9 months, the Business Unit’s activity dropped by €6.8M to €45.2M versus €52.0M. On 30 September 2017, the number of screens under VPF contract stood at 5,919 as compared to 6,029 in 2016. 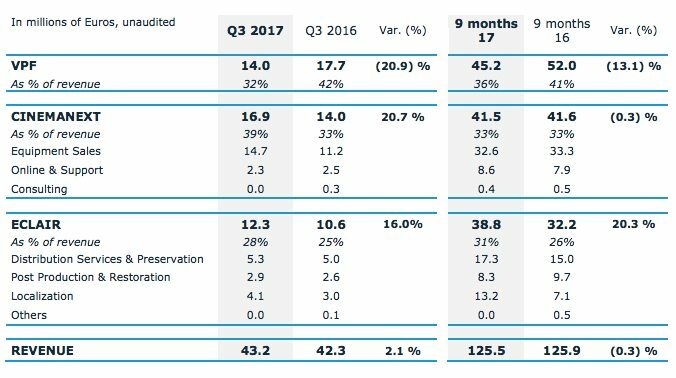 CinemaNext revenue rose substantially during Q3 2017, thus making up the ground lost during the first half year. Driven by major projects for the creation of complexes, revenue increased by +20.7% to €16.9M. Over 9 months, activity for the Business Unit remained stable, accounting for 33.0% of the Group’s revenue and standing at €41.5M. Equipment sales were the key driver of growth for the quarter. Eclair recorded strong growth in Q3 2017 and over the first 9 months of the year thanks to the additional revenue generated by the companies acquired in the last quarter of 2016. The Business Unit saw its revenue increase by +16.0% to €12.3M during the quarter. Over 9 months, Eclair totalled €38.8M in sales and now represents +31% of the Group’s total revenue. The strongest sales growth was seen in the Versioning and Accessibility division, which made the most significant acquisitions in 2016. In accordance with the strategic plan presented in late 2016, the technology and services activities are increasingly taking over from the Virtual Print Fee in driving growth for the Group. After a first half-year marked by a temporary stagnation in sales, the Group demonstrated its ability to win market shares and create growth despite the market’s current “wait-and-see” stance, with its revenue once more on the up in Q3. This growth, together with ongoing efforts since the start of the year, means Ymagis can reiterate its target to achieve a return to profitability for Eclair’s activities by the end of the year with a positive EBITDA. Moreover, the new organisation and implementation of a strategy to conquer new international sales opportunities in services activities in Europe and the United States will drive growth for the Group, compensating for the scheduled decline in revenue for VPF activities. To highlight its position as a technological innovator, after the successful launches of EclairColor and EclairPlay, Ymagis is continuing its Product Innovation programme in incubator mode to benefit from the greatest possible degree of flexibility. The aim is to continue the transformation initiated by the Group, focusing on innovative services with high added value for all its customers.